Our customers who have used Armstrong Clark hardwood deck stain continue to be satisfied by the appearance and longevity of their deck stain projects. If you have used Armstrong Clark hardwood deck stain, we appreciate your input, so feel free to leave a comment below and pictures of your completed projects if you have them. Any other questions on using Armstrong Clark, just ask below. A high solids pigmented finish made from heavy and light bodied oils specially formulated for application on unpainted hardwoods. Heavy bodied oils provide water repellency. Extra pigments provide enhanced color retention on hardwoods. Light bodied oils combined with solvent penetrate into the wood. Armstrong’s Semi-Transparent Hardwood Finishes repels water, retain color longer and reduce the frequency of re-coats on maintenance intensive hardwoods. Exotic hardwoods such as IPE are extremely dense and difficult to penetrate. These wood types when stained, will always fade faster than other woods such as Cedar, Redwood, and Pine. Testing will be changed to 1 year instead of 2 years for exotic hardwoods. – The Armstrong Clark in the Mahogany color had a very rich look on our IPE test deck. We applied one coat at the Mahogany color enhanced the natural colors of the IPE with a reddish brown color. The stain did not film on the surface but absorbed into the wood. – We found the Armstrong Clark in Mahogany outperformed all other Hardwood deck stains when it comes to color retention on Ipe. Many of the stains we tested had lost the color within 8 months while Armstrong still had a decent amount of color. See the picture below for a sample board that we tested. – Armstrong Clark Hardwood stain did not peel on our test deck. A small amount of wear was noticeable around the door. 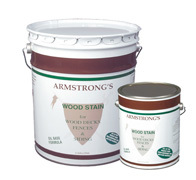 Armstrong penetrates very well into IPE wood. 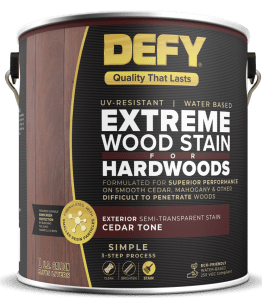 Note: Defy Extreme Hardwood Stain had a label change in 2019. Welcome to Deckstainhelp.com, your number one source for deck staining tips and latest industry news on the internet. This year in 2019 those who use Defy Hardwood wood stain continued to be satisfied with the quality and longevity of their deck stain projects. We encourage discussion on our site, so feel free to leave a comment below. 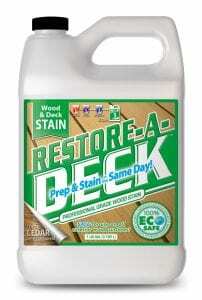 Important Note: This is our 2nd Review of Defy Deck Stain for Hardwoods. Our first review of the Defy Hardwood Stain was started in 2010 and completed in 2011. 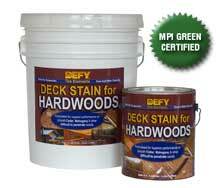 DEFY Deck Stain for Hardwoods is formulated with smaller resins that penetrate hardwoods, or oily softwoods better. 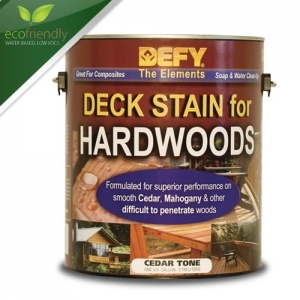 If you’re looking for the best stain for cedar decks in a water-based product, then look no further. DEFY Deck Stain for Hardwoods is a synthetic, semi-transparent deck sealer specifically formulated for use on Teak, IPE, Mahogany, Tigerwood, and other exotic hardwoods. Defy Hardwood Stain should also be considered for oil-rich woods such as Cedar and Redwood, offering better penetration for these wood types. For the IPE wood, the customer wanted a reddish brown color to enhance the grain. Best color for this is the Light Walnut. The Defy Hardwood did an excellent job of enhancing the grain. It did not film or “cover” the wood grain showing 100% of the natural color tones. For Exotic wood stains, we only test for 1 year. The Defy Hardwood Stain retained about 70% of the original color after the full year. It had faded but no graying of the IPE was visible. The Defy Hardwood does a very good job of penetrating exotic woods. No filming was noticed when completed and the wearing was acceptable after the year. There was some visible wearing on the steps. Make sure that if you use the Defy Hardwood on IPE that you apply only one coat. Too much stain and it will not absorb leading to an increased chance of wear/tear. We learned this from past experience when treating exotic hardwoods. DeckStainHelp.com is the Internet’s go-to site for all things wood deck restoration related. Just like all different types of wood surfaces, we recommend you properly prep your IPE wood prior to staining with a penetrating exotic hardwood stain in 2019. Feel free to leave us a comment with pictures and any questions you may have below. Maintaining an exotic hardwood such as Ipe requires a little more patience and the proper deck stain. The vital key to consider when choosing a lasting finish is the density of the wood. This determines how deep the stain will be able to penetrate. Ipe decking is extremely dense and tough for a deck stain to penetrate. On newer Ipe wood a deck stain may only penetrate as little as a few millimeters. For this reason, any type of deck stain will only last about a year, so regular maintenance definitely comes into play. Most decks stains are too low in resins and pigment solids to penetrate Ipe wood and wouldn’t last long or be very appealing. Special deck stains specifically designed for Ipe are necessary to get as much protection as possible. 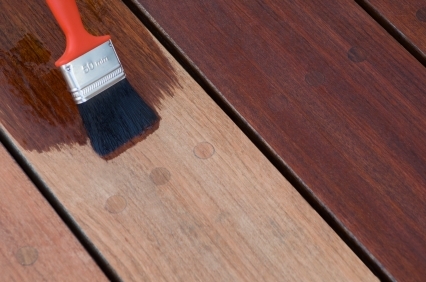 Ipe deck stains are designed to give a more lasting and maintainable finish. They are rich in oil alkyd resins that are more effective when dealing with limited penetration from dense wood. IPE Oil has become popular in the past years. It is an oil-based semi-transparent stain that will give a brownish tint to your IPE or other exotic hardwoods. If you have used the Ipe Oil Hardwood Stain, please post a review in our Star Ratings and or comment area. Our comment system does allow the ability to post pictures of your deck or exterior wood. Ipe Oil™ Hardwood Deck Finish is designed specifically for IPE and other Brazilian Hardwoods. Ipe Oil™ Hardwood Deck Finish offers deep penetration into dense exotic woods protecting the wood from water and UV damage. 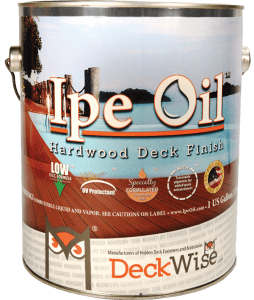 Ipe Oil™ can be used on all types of wood including ipe, tigerwood, cumaru, or and hardwood decking and wood siding, preserving the natural grain while enhancing at the same time. Ipe Oil™ Deck Finish is a 250 VOC compliant oil-based finish that can be used in all 50 states. Exotic hardwoods such as IPE are extremely dense and difficult to penetrate. These wood types when stained will always fade faster than other woods such as Cedar, Redwood, and Pine. Testing will be changed to 1 year instead of 2 years for exotic hardwoods. – IPE Oil comes in only a Natural Finish. This is a transparent but pigmented color that really enhances the natural grain of the wood. The finished look after drying was a beautiful rich tone of brown with a hint of red throughout our IPE wood. – We only test exotic hardwoods for 1 year. IPE oil had retained most of its color. Only about 30% of the color has faded from the wood. The was still a decent amount of color left. – IPE Oil penetrates very well into exotic hardwoods. There wasn’t any peeling of the stain from the wood, even in the high traffic areas. DeckStainHelp.com continues to be the Internet’s go-to site for wood deck restoration tips throughout 2019. In this revised Hardwood Deck Stain article, we offer suggestions for how to care for your hardwood deck by applying a high-quality stain. If you have stained a hardwood deck, feel free to leave us a comment with pictures. There are many different types of wood used for decking material. While the most common is pressure treated pine, some of the most beautiful are any of the exotic hardwoods. Woods such as Ipe, Redwood, Brazilian, Mahogany, Teak, and Pau Lupe are very sought after for deck owners looking for a gorgeous yet durable deck. Hardwood decks, like other wood decks, are subjected to the elements and need to be protected with a deck stain or sealer. Hardwoods have different characteristics from more common wood types used in decking. As the name suggests, they are very hard or dense in nature. This means searching for the right deck stain when it comes to protection. Messmers UV Plus for Hardwoods was developed to penetrate and protect exotic hardwoods. This stain will help preserve and protect hardwoods from UV fading and water absorption. The two colors available will restore the wood’s natural color tones. 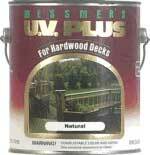 Messmers UV Plus for Hardwoods was the first stain specifically designed for difficult to penetrate exotic woods. – The Red Mahogany color was used for the IPE test deck. We choose this color since the manufacturer said it would last a little longer than the Natural tint. The stained appearance when dry was a beautiful color of reddish brown tones throughout our IPE. – As mentioned previously we only test exotic hardwoods for 1 year. Messmers retained 70% of its original color after one year in the full sun areas and close to 80% in the shaded areas. Overall good results for an IPE deck. – The Messmers Hardwood stain exhibited little to no peeling on the wood. The stain faded evenly without any wear patterns. Penofin continues to have issues with darkening or turning black on a vast majority of wood decks and exterior wood. Penofin For Hardwood Stain is a 99% UV protection Brazilian Rosewood Oil finish. This stain was developed to protect and preserve Hardwoods such as IPE and Mahogany. Their exotic hardwood formula penetrates deep into the wood cells. This results in a natural finished look to your wood. Penofin Penetrating Oil Finish can meet the needs of hardwood in fiber protection, penetration, stabilizing, and nourishment. – Beautiful! Penofin has traditionally produced some of the nicest finishes and the Penofin Exotic Hardwood Stain does not disappoint. The mahogany wood has a deep richness to it when the Penofin was applied. – The Penofin Exotic Wood Stain only retained 40% of its color after the year period. As mentioned previously we only test exotic hardwoods for 1 year. Penofin suggests that the stain should be reapplied every 3-6 months for exotic hardwoods. This seems a bit much but if you have the time then it would make sense to reapply twice a year. – Penofin’s ability to penetrate deep into the wood fibers greatly minimizes any chance of peeling and wearing. This is one of Penofin’s very popular traits.